My 2011 Father’s Day weekend | Tales From The Ipe! This was a pretty nice Father’s Day weekend. I purposely asked that we didn’t do any big dinner or gifts this year. I don’t need it, and we should try to save a little money. What I did want was some free time to hit the gym and go cycling this weekend. This past month (since the MS ride) has been a very long month, with little time afforded to me to work out in the evenings, or go riding on the weekends. We didn’t get to do everything on the potential agenda e.g. movie night, but it was close enough. We have Kung Fu Panda sitting in its Netflix mailer, but we’ll have to watch it next week instead. Saturday morning, I hit the gym, then my wife had to run some errands. While she was out, Lily and I picked Josh, who had spent the past two days/nights hanging with his maternal grandparents. When she got back, we hit the animal hospital to check out some kittens up for adoption. Afterwards, we did some shopping. I made what some might call a Chinese dinner: chicken fried rice with veggies sautéed in a General Tso’s sauce. Next time, I’ll plan ahead, and have some scallions on hand for garnish! Sunday was proving to be one packed itinerary. I planned to go cycling in the morning, then we would take the kids to the neighborhood pool, lunch at home, then get ready and go to my father-in-law’s *last* church service. I use the word “last” loosely, since he’s retiring from his primary church, but he’s not actually “retiring.” Ah, I’m not going to get into it again. Whatever. Sunday morning, the kids were sleeping, and my wife was working on her speech for later that evening. I got ready in my cycling clothes, made myself some eggs and stuff for a hearty breakfast, and mapped out a decent ride around the area. I used a book that my wife got me for my birthday last year with routes all around NJ. A little after 8 AM, I was out the door. 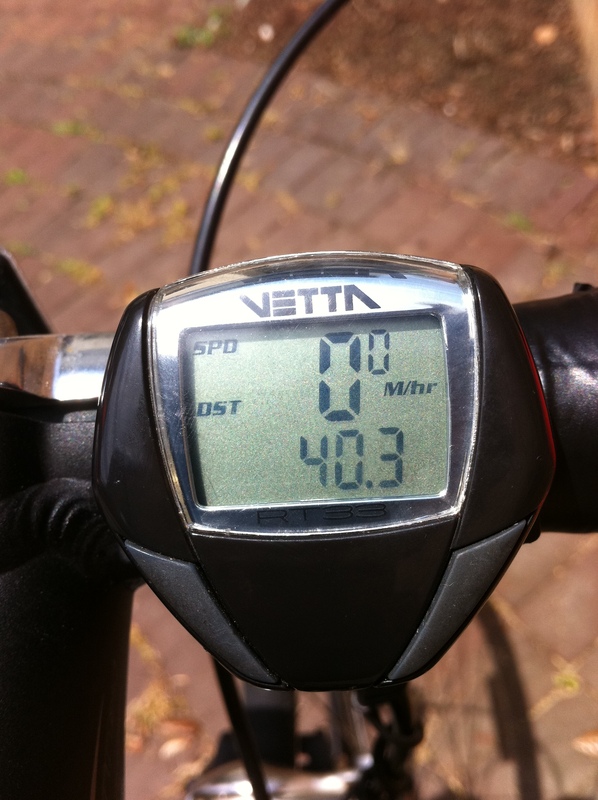 I rode for a little while heading up to Cranbury, when I realized that my cyclocomputer wasn’t registering any mileage. It still said 0.0! Argh, I said, and stopped to figure out what was wrong. Now, I figured that the magnet and sensor got jostled on the bus ride back from Tuckerton Seaport last month, but I took the bike for a tuneup last week, and specifically told them it may need alignment. It seems they never bothered to check this out. Speaking in the 3rd person, I will say that Joel was annoyed. I messed around with the sensor, and it started registering, so I got back on the road heading up to Cranbury, NJ. I didn’t quite follow the route listed, as I decided to not go all the way to the “starting point” marked in the route. Instead I thought I’d try to find one of the streets, and just go from there. Unfortunately, using the route and my iPhone’s Google Maps, I still had issues trying to find some of these streets. I eventually found my way, but I wasted a bit too much of my morning trying to find my way back to the route. I was probably better off just going to the specified starting point. As the morning drew on, it got progressively hotter, but I rode decently. In hindsight, I’m very glad I went for the 2nd bottle cage and water bottle, as I finished both on the ride, and then stopped at the Clarksburg General Store to get another large water bottle for a refill. I was only eight miles away from home, which would get me at about 38 miles in total, so I figured that was pretty good for today. I, of course, after using Google Maps, still went the wrong way, and had to backtrack again. I reached home a little after 12 noon. In total? 40 miles for the day, and 175 miles on the 2011 odometer. 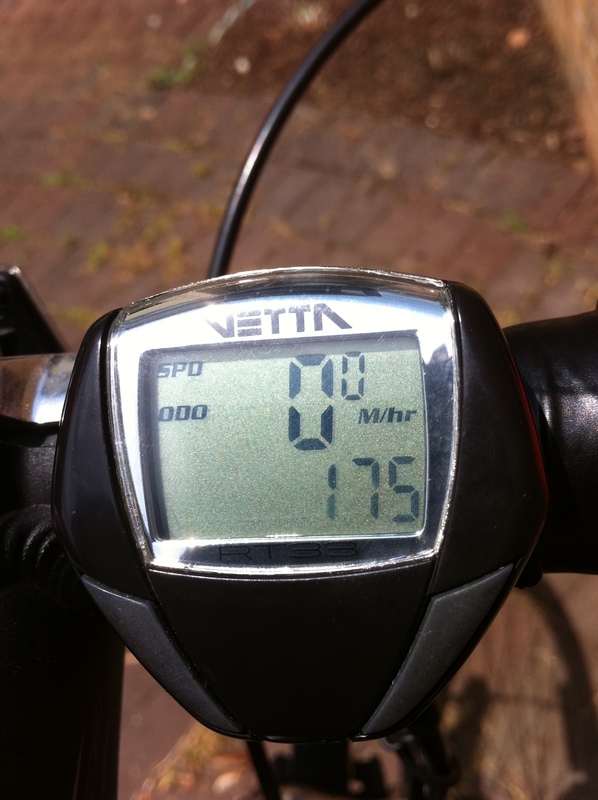 I think I can hit 200 miles next ride, which I hope is very soon. Since my personal best is just short of 600 miles in 2004, I’d like to beat that this year. I’m 1/3 of the way there now. The family had a little surprise for me, with cards and gifts, which I appreciated. I can’t wait to try out my new Swiss army knife. We had a short but closing window to hit the pool, so my wife got the kids ready for the pool before I got there, and I showered and got into my swim trunks. We hustled over to the pool, and swam around for the a while. My wife stayed out of the water, enjoying the rays. In too short a time, we had to get back and get ready. I picked up a quick lunch from 7-Eleven for the kids and me, and then we raced to get everyone showered and dressed. 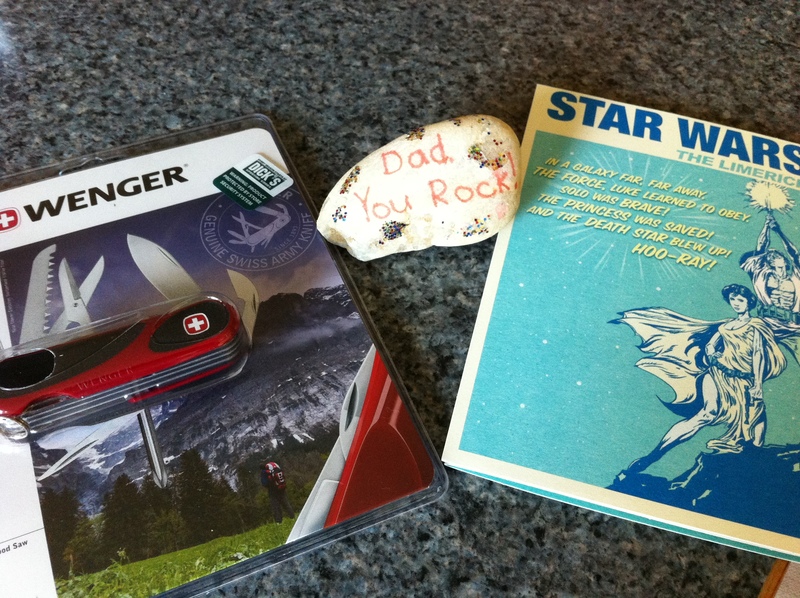 Some of my Father's Day gifts and cards. I like the Star Wars card a lot! Naturally, we out of the house a little later than expected, and still had to get gas for the car. However, we now had less than an hour to get up there and get seats. I won’t mention all the details, but… the good news is that we made it there before 4pm, and the bad news is that I certainly made some enemies on the northbound NJ Turnpike that day. It was hot that day, but the kids were mostly behaved. After all the speeches, we went downstairs to eat and talk. We got out of there around 9pm, but then we had to get a few groceries (and pool shoes for Josh), so we hit ShopRite around 10:15 pm with the whole family. By the time we finally got home and got the kids to bed, we were all very tired. This entry was posted in Family, Personal and tagged cats, church, cycling, fathers day, fitness, pets, pool. Bookmark the permalink.